Chris Balderstone was a true Roy of the Rovers all-rounder. As a footballer he was signed by Bill Shankly for Huddersfield Town in 1958 although one Denis Law kept him out of the first team until the following year. He went on to play for Carlisle, Doncaster and Queen of the South. At Carlisle he scored a penalty for the Cumbrians against Spurs on Saturday August 24th 1974 - the only goal of the match and a victory that put Carlisle on top of the old First Division for just a few days. Carlisle results/table 1974/75. As a cricketer he made his debut for Yorkshire in 1961 before moving to another strong and successful club, Leicestershire. He made two Test appearances for England and following retirement he became a first-class umpire, officiating in two one-day internationals. The two sports once famously combined to earn him a bit of a 'Superman' reputation. On Monday 15th September 1975 he played cricket for Leicestershire against Derbyshire at Chesterfield and at close of play he was 51 not out. A quick drive to Belle Vue followed and he played for Doncaster Rovers in the evening in a 1-1 draw against Brentford in the Fourth Division. The following morning he was back playing cricket, finishing his innings on 116 and taking 3 wickets for 28 runs to help win the County Championship for Leicestershire for the first time. Amazing! The trick pub quiz question is - name the three England captains who have played for Scunthorpe United? Kevin Keegan, Ray Clemence and....Ian Botham. Former England cricketer Botham made his Football League debut for Scunthorpe as a sub away to Bournemouth on Tuesday March 25th 1980, a 3-3 draw. He made his starting debut a couple of years later in Scunthorpe's home match against Wigan on Friday March 12th 1982. A memorable match - Scunthorpe lost 2-7, their worst home League defeat! In total Ian Botham played 11 League games for Scunthorpe as a non-contract player and of course with a record like that was awarded a benefit match....against Manchester United! Brothers Denis and Leslie Compton had sport, and more particularly Arsenal and Middlesex, in their genes. Leslie was the more successful footballer of the two making a total of 253 League appearances for Arsenal between 1932 and 1952 and playing twice for England. He was 38 years and 64 days old when he made his debut for England, against Wales in 1950, making him the oldest-ever outfield England debuntant. Between 1938 and 1956 he kept wicket for Middlesex, playing a total of 274 first class matches. Denis made 54 League appearances for Arsenal between 1936 and 1950 and played 12 times for England in war-time (unofficial) internationals. Cricket was his main sport, making 78 Test appearances for England while scoring 38942 runs and taking 622 wickets in a total of 515 first class matches played. The brothers played alongside each other in Arsenal's League Championship successes of 1937/38 and 1947/48, in Middlesex's County Championship victory in 1947 and were both in the Arsenal side that defeated Liverpool in the 1950 FA Cup Final at Wembley. A remarkable family achievement. Trevor Ford enjoyed his cricket but his career was in football. A centre-forward, he played for Swansea, Aston Villa, Sunderland, Cardiff, PSV Eindhoven and Newport County as well as making 38 appearances for Wales. After retiring from football he made a cameo appearance in a very famous County Championship cricket match between Glamorgan and Nottinghamshire. On August 31st 1968 at the St Helen's ground in his home town of Swansea he made a brief appearance for Glamorgan as a substitute fielder for the injured Ossie Wheatley. Later that day Nottinghamshire's Gary Sobers became the first person ever to score six sixes in one over, the unfortunate bowler being Malcolm Nash. The greatest all-rounder of them all was CB Fry. An amateur footballer, he played for the Corinthians as well as a total of 18 Southern League matches for Southampton and Portsmouth. While at Southampton he won an England cap against Ireland and played for the Saints in the 1902 FA Cup final against Sheffield United, who had 'Fatty' Foulke in their line-up. Two days after their replay defeat in that final Fry scored 82 when opening the batting with WG Grace for London County at the Oval. As a cricketer he made 26 appearances for England and during his career scored 94 centuries. As well as being a double international he held the world long-jump record for a while, played for Blackheath and the Barbarians at Rugby Union, he was a writer, edited his own magazines, broadcaster, unsuccessfully stood in three General Elections, he met Hitler and was once reputedly offered the throne of Albania. I bet I could have beaten him at WII ten pin bowling though! Geoff Hurst holds the record as the only footballer to have scored a World Cup final hat-trick but he also holds the record of being the only World Cup winner to have played County Championship cricket. He did this just once - for Essex against Lancashire at Liverpool in 1962 but also played 23 times for Essex 2nd XI during the summers of 1962, 1963 and 1964. Gary Lineker was another sporting all-rounder. He captained Leicestershire Schools and played for the County 2nd XI before concentrating on football. He later played for the MCC against Germany at Lords in 1992 scoring a single run - 'I always score one against Germany' he said. 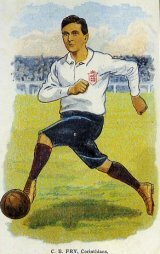 Arthur Milton was the last of the England double internationals. He made his international debut at football for England against Austria in 1951 after having played only 12 League matches for Arsenal. He retired from football in the summer of 1955 after making a total of 89 League appearances for the Gunners and Bristol City. He was also a Gloucestershire cricketer from 1948 to 1974 and made 6 appearances for England. 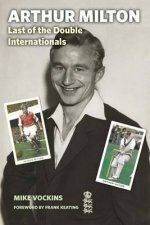 He made a century on his England debut, against New Zealand at Headingley in July 1958, opening the batting in that Test with another double international MJK (Mike) Smith (cricket and rugby union). "My last ever game of cricket was for Lancashire seconds. I got called in by my school and they told me I was missing too much time. They said I had to give up either football or cricket, but I had just played at Wembley against an Italian team containing Totti so that swayed me. And Lancashire didn't offer me anything either. In the end, my maths teacher helped me make my decision." Ian Botham's Somerset team-mate Viv Richards was a double World Cup international. He was a World Cup winner for the West Indies at cricket but somewhat less successful when playing football for Antigua in the 1974 World Cup qualifiers. W ith Moore, Hurst and Peters in the side it would be easy to overlook the sporting prowess of the other members of the West Ham United side of the mid-sixties. One of them was goalkeeper Jim Standen. In 1964 he was part of the Hammers' side that won the FA Cup for the first time and during the summer a member of the Worcestershire side that won the County Championship, also for the first time. His medium pace bowling saw him take 64 wickets at 13 runs each (best performance 7-30) to finish top of the County Championship bowling averages. In 1965 he was back at Wembley with the West Ham side that beat Munich 1860 in the European Cup Winners Cup Final and although Worcestershire retained their cricket title Standen played in only one of their matches. I started the above section by saying that there was little overlap between the cricket and football seasons - but sometimes what overlap there was did cause problems. Back in the 1950s Ron Nicholls and Barrie Meyer where decent footballers with Second Division Bristol Rovers. 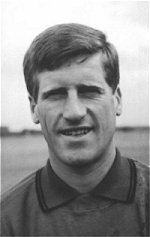 Barrie Meyer scored 60 goals in 139 League outings for Rovers while Ron Nicholls made 71 League appearances as goalkeeper for the club. But they were also decent Gloucestershire County cricketers - Nicholls was later part of Gloucestershire's record wicket stand scoring 217 of the 395 partnership score while wicketkeeper Meyer was to make 826 dismissals in 406 first class matches for the County. The problem arose in the summer of 1958 when both players refused to report back for the start of pre-season training with Bristol Rovers and remained with Gloucestershire until the end of the cricket season. Both were soon on the transfer list - Nicholls was transferred to Cardiff City (he later played for Bristol City) while Meyer moved on to Plymouth Argyle and later played for Newport County and Bristol City. Both Nicholls and Meyer were both members of the Bristol Rovers team that recorded one of the clubs' greatest result - a 4-0 defeat of the Busby Babes of Manchester United in the FA Cup in January 1956. 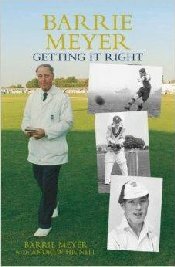 The 35,872 Eastville crowd saw Meyer score one of those four goals and that highlight in his football career was later matched in his cricket career when on his retirement from playing he was appointed a Test match umpire, officiating in 26 Tests. So he is has the distinction of being the only Test match umpire to score an FA Cup goal against Manchester United - now that's a quiz question if ever there was one! Sheffield United were formed by Yorkshire Cricket Club in March 1889 just six days after Bramall Lane had staged an FA Cup semi-final which had taken £600 in receipts. The cricket club decided that regular football at the ground would prove successful (Bramall Lane). It did prove successful, so much so that the football club became the senior partner and eventually evicted the cricket club from the ground. Yorkshire played their last County match at Bramall Lane in August 1973, drawing with Leicestershire. 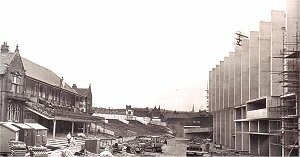 The South Stand at Bramall Lane was then built on part of the former cricket ground, finally enclosing the football ground on all four sides. 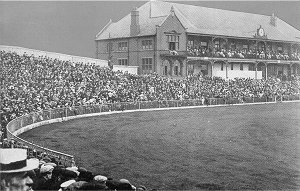 Yorkshire staged 339 County Championship matches at Bramall Lane and in July 1902 became the only current Football League ground ever to host a Test Match, England losing to Australia by 143 runs. However, with Bramall Lane suffering from poor light because of the smoke emissions of local factories it proved to be the only one the ground hosted. Pictured is the crowd at the Bramall Lane Test showing the Pavilion in its hey-day, in contrast to the picture above which shows the same Pavilion shortly before it was demolished to make way for yet another car park. Following the loss of cricket at Bramall Lane the last ground to host both Football League and County Championship matches was the County Ground at Northampton. 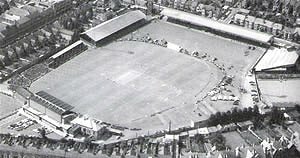 Originally a cricket ground, Northampton Town were residents of the County Ground from their formation in 1897. The football pitch had the reputation of having the worst playing surface in the League which was largely the result of the pitch being used as a spectator area/car park/picnic area during the cricket season. 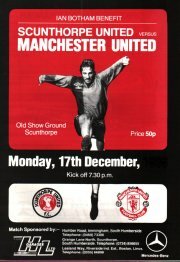 The Cobblers played their last match there on Tuesday October 11th 1994, a 0-1 Division 3 defeat by Mansfield. Four days later they drew 1-1 with Barnet in their first match at the Sixfields Stadium. At a general meeting held on Wednesday last, at the Adelphi Hotel, it was decided to form a football club in connection with the above influential cricket club, with the object of keeping together during the winter season the members of this cricket club. From the great unanimity which prevailed as to the desirability of forming the club, there is every reason to expect that it will take first rank. The office bearers were elected as follows: - President, Mr. B. Chatterton; vice-president and treasurer, Mr. F. S. Chambers; hon. Secretary, Mr. Jno. Marsh; assistant, Mr. Castleton. Committee: Messrs Jno. Rodgers, Jno. White, C. Stokes, and H. Bocking. About sixty were enrolled without any canvas, some of them being the best players of the town. It's not just some of the English football clubs who can trace their origins back to cricket but one one of the most famous foreign clubs of them all can - AC Milan. No joking! 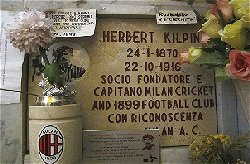 AC Milan were founded back in December 1899 by a group of English expats led by Herbert Kilpin and Alfred Edwards as the Milan Cricket and Football Club. Although the cricket section hasn't lasted the passing of time the English spelling of their Milan name has. The Milan in AC Milan is spelt the English way, rather than the Italian spelling of Milano, in a lasting tribute to their English founders. Darlington's old Feethams ground was next-door to a cricket ground. 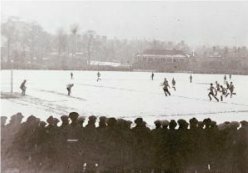 On December 29th 1923 Darlington's Third Division (North) match against Chesterfield couldn't be played at the Feethams because of a frozen pitch so the match was moved to the cricket ground. A crowd of 5675 saw Darlington record a 2-1 victory. When the cricketing authorities decided to experiment with floodlit cricket in England they had a problem - no English cricket grounds had floodlights! So they turned to football for help. 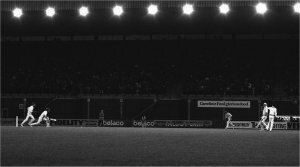 On August 14th 1980 Chelsea's Stamford Bridge ground hosted the first senior day-night match in England, Essex against the West Indies. An artificial pitch was laid but a football pitch is not the ideal shape for cricket. Being long and thin it was an easy matter to hit sixes to the short boundaries - Graham Gooch hit a century in just 77 minutes and in one 18-minutes spell Viv Richards scored 53 runs. A crowd of 11,073 made it a success full experiment, so much so that when Chelsea played Wrexham two days later in their opening Football League fixture of the season the chant of 'We want cricket' was heard during the slower moments of the game. 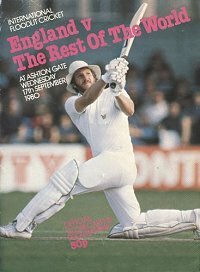 A month later, on 17th September 1980 an England XI (including Botham, Gooch, Boycott and Gatting) played the Rest of the World (including Richards, Gavaskar, Lloyd and Marshall) in a 40-over match at Bristol City's Ashton Gate Ground. A crowd of 7925 made it a profitable venture but the experiment didn't bring a lasting union between the sports with the major cricket grounds getting their own floodlights. It has become less common over the years for players to have careers in both sports so in February 2015 it came as a surprise when Steve Harmison became manager of Ashington FC. Steve Harmiston was a former Durham fast-bowler who had played 63 times for England - including in an Ashes-winning series - and had taken 63 Test wickets. Ashington Football Club were members of the Northern League and were part of the ninth level of football in England with a normal attendance of around 200 at their Woodhorn Lane ground. Explaining his reasons for managing a football club rather than coaching a cricket side he said that he had always supported his hometown club, playing for them before he joined Durham and then training with them while he played for Durham. But then he perhaps spoilt it a bit by saying that his first love in football was Newcastle United! Well, one thing that you will probably never see nowadays is a friendly cricket match between two football clubs, it often used to happen. 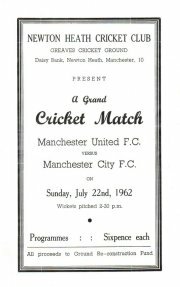 One example was this friendly between Manchester United and Manchester City in 1962 but with so many foreign players in the game could any club muster up 11 players who now even know how to play cricket? And that hard ball - which club would allow any of their pampered stars to risk injury playing the game?